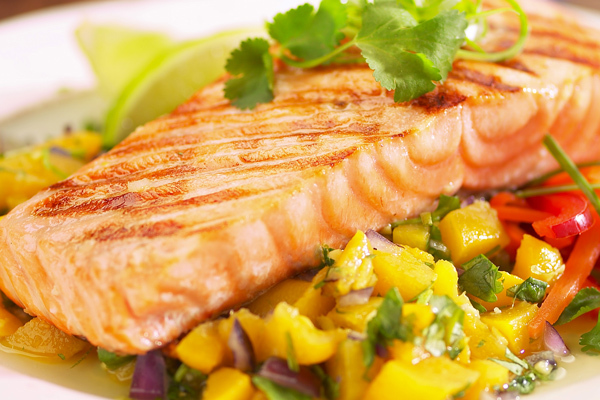 Grilled salmon is a delicious summer barbecue treat. This ginger peach salsa is not only a very colourful accompaniment but is also very refreshing, as it is sweet, salty and a little bit spicy. Prepare salsa. In a mixing bowl, combine all of the salsa ingredients and gently mix well. Place in refrigerator for at least 15 minutes to allow flavours to combine well. Prepare marinade. In a shallow bowl or plastic container, combine all marinade ingredients. Whisk together with a fork until well combined. Place salmon fillets skin side up in the marinade. Cover and refrigerate for 15 to 25 minutes. Do not allow salmon to remain in marinade too long or the acid from the soy sauce and lime juice will begin to cook the fish. Remove salmon from marinade and grill on barbecue to desired doneness (about 10 to 15 minutes). You may also cook salmon in a frying pan or bake in the oven. Serve salmon immediately. Spoon salsa over top of each piece of fish or serve on the side. Garnish with additional cilantro and a lime wedge if desired. 1 serving of fruits and vegetables per person. Suitable for diabetic, heart-healthy and low-fat diets.